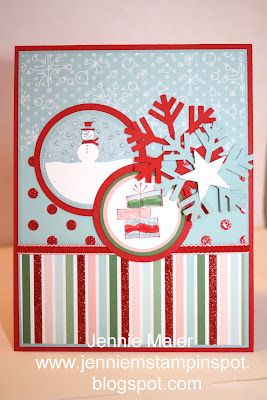 Finally got to do some stamping after the holidays, so I made this with the PPA#74 sketch here. 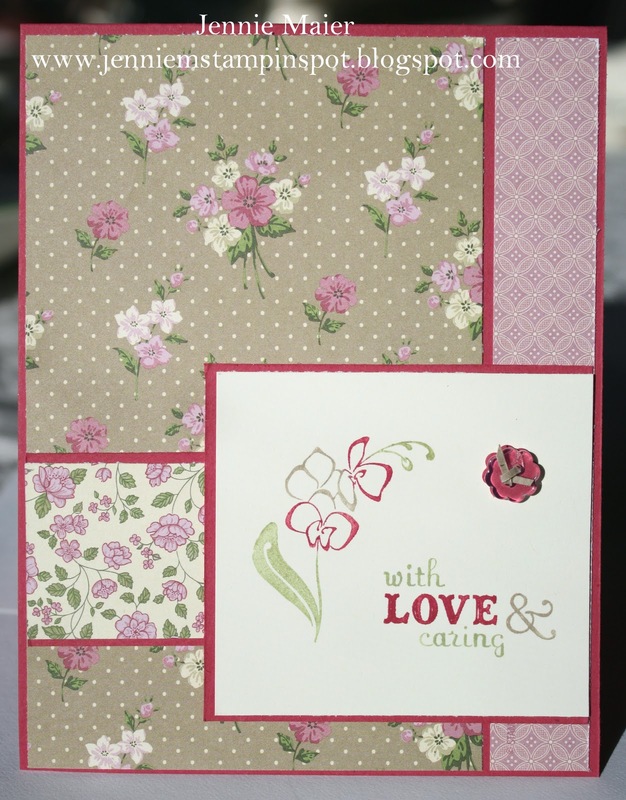 Rose Red is the card stock base and the papers are from the Springtime Vintage DSP in the Occasions Mini up for sale on January 4th. The stamp set is Thanks for Caring. I colored the flower and sentiment with Rose Red, Crumb Cake and Pear Pizzazz Stampin write markers. I punched out the little flower in Rose Red card stock with the Itty Bitty Shape Punches Pack and used a matching Bitty Button, threaded with some Crumb Cake card stock. 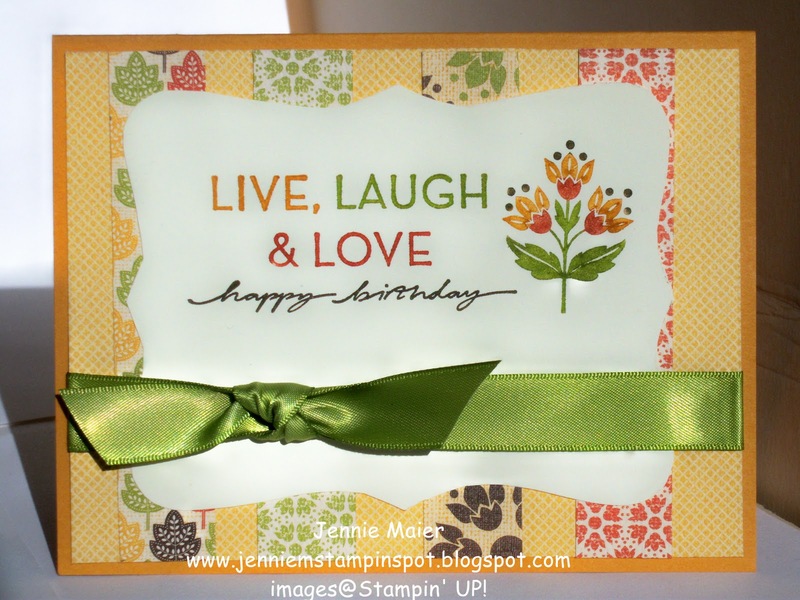 This birthday card was made with the MojoMonday sketch#170 here. The base is Baha Breeze and I added some Pear Pizzazz. I used some papers from Greenhouse Gala DSP and the striped paper is from the DSP Pack In-Color. The Chocolate Chip scallop piece is was cut with the Scallop Circles #2 Bigz Die and the Baha Breeze circle was cut with the Circles#2 die.The DSP circle was punched with the 1 3/4 inch XL Circle punch. I stamped the sentiment from Perfect Punches in Pear Pizzazz on Whisper White and punched it out with the 2 by 1 3/8 inch XL Oval punch. 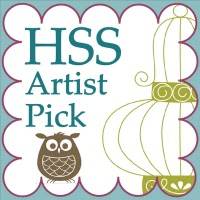 I trimmed that down and layered it onto a Pear Pizzazz piece punched with the same oval punch. I popped those ovals up with Stampin dimensionals.Finally, some 1/2 inch Pear Pizzazz stitched-poly ribbon finishes it off. Since I'm done with my Christmas cards, I made this Valentine's card using the Filled With Love promo and the Splitcoast Color Combo#302 here. The colors are Basic Black, Real Red and White. I started with a base of Basic Black and added DSP from the Love Patterns DSP. 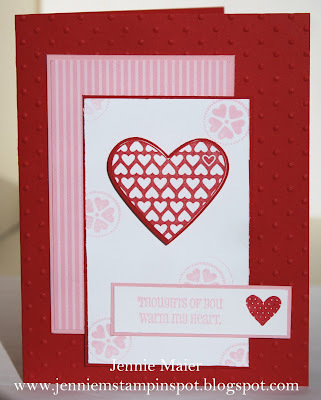 I stamped the heart in Real Red on Whisper White and punched it out with the XL Full Heart punch. I trimmed it down a bit and layered it onto a Real Red piece punched with the Heart punch. I colored in the little heart with my Basic Black Stampin write marker and popped that up with Stampin dimensionals. 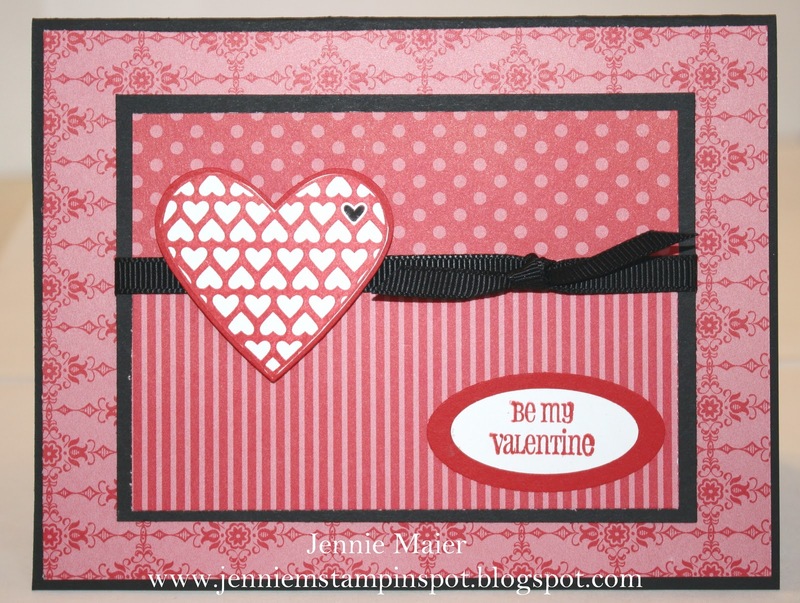 I stamped Be my Valentine in Real Red and punched that out with the 1 3/8 by 5/8 inch Oval punch. I layered that onto a Real Red piece punched with the 1 3/4 by 7/8 inch Oval punch. Finally, some 1/4 inch Basic Black grosgrain finish it off. Here's another peek at the Springtime Vintage DSP from the Occasions Mini Catalog. 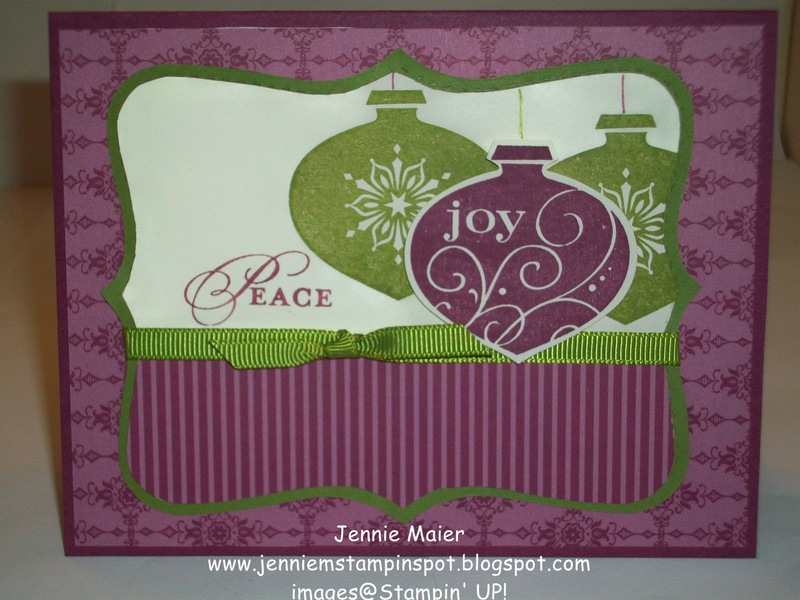 I used the Stamping 411 sketch#182 here. The base is Baha Breeze card stock and then I added three different patterns from the Springtime Vintage DSP. 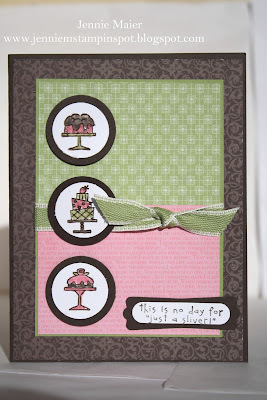 I colored in the stamp from Vintage Vogue with the Baha Breeze and Rose Red Stampin write markers and stamped that on a Very Vanilla piece cut with the Circles #2 Big Shot die. 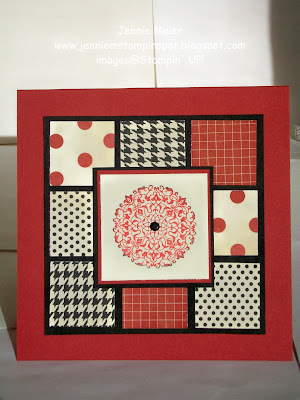 I then punched out a Rose Red piece with the XL 2 3/8 inch Scallop Circle punch and popped that up with Stampin dimensionals. Finally, a piece of 1/4 inch Very Vanilla grosgrain ribbon finishes it off. 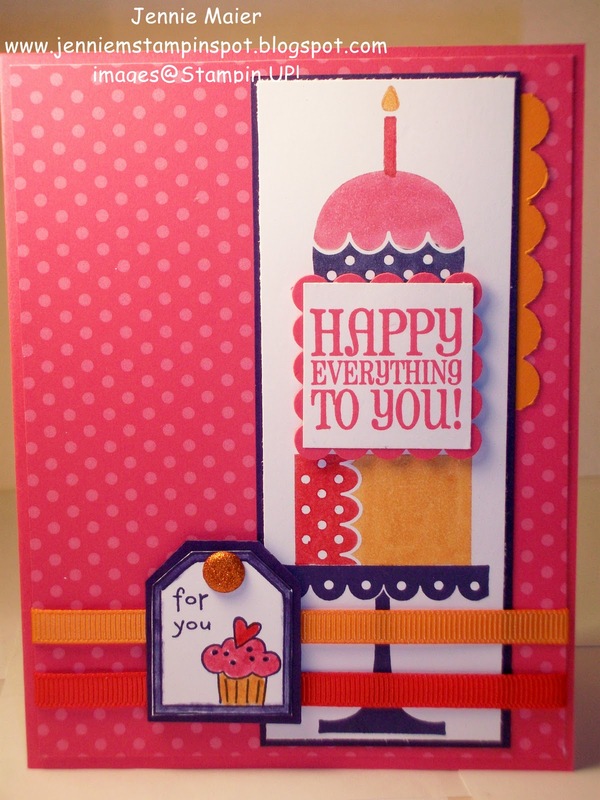 I needed to make a baby card and thought of the Sale-a-bration Ice Cream Parlor DSP. The DSP also comes with a coordinating Accents Pack-it's great! Especially since we don't know if it's a boy or a girl, I think this paper works great for this card! 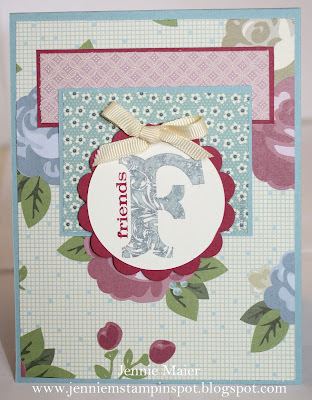 I also used this week's FTL layout at Clean and Simple Stamping here. 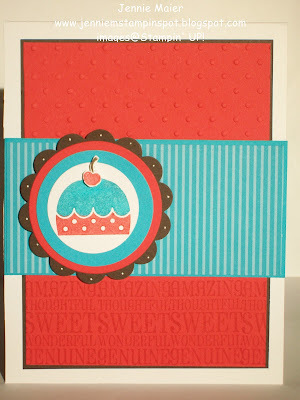 The card stock base is Daffodil Delight and I added some Old Olive before adding the striped DSP from Ice Cream Parlor. 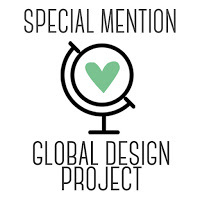 The dotted and scallop print is also from the Ice Cream Parlor DSP. I stamped the turtle from Fox and Friends in Old Olive and punched it out with the 1 3/8 inch Circle punch. 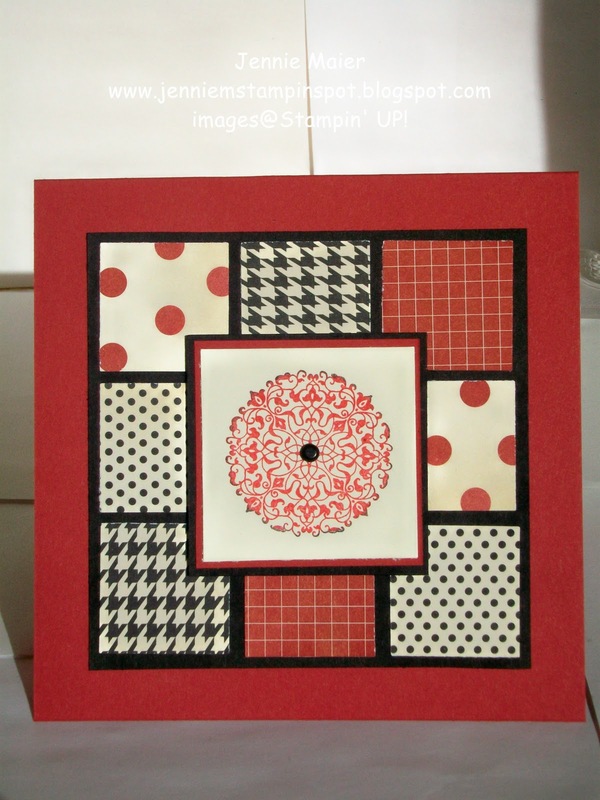 I used my Circles #2 Bigz die to cut out the Old Olive circle behind the Whisper White one. 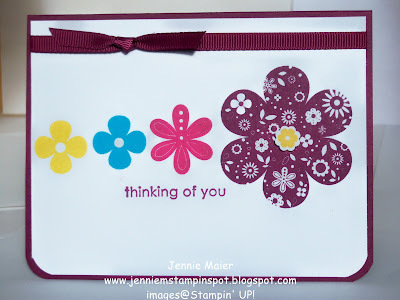 Those were then popped up with Stampin dimensionals. 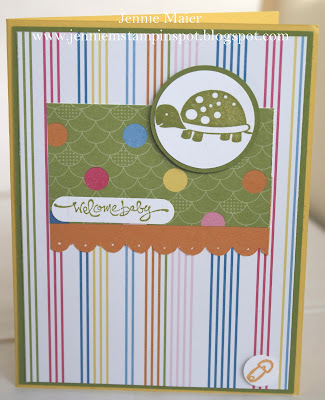 Welcome baby from Short and Sweet was stamped in Old Olive then punched out with the Word Window punch. A piece of Peach Parfait card stock was run thru the Scallop Edge border punch and I added some dots with my White gel pen. 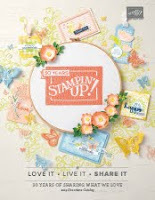 Finally, I stamped the diaper pin from Short and Sweet in Peach Parfait, punched it out with the 1/2 inch Circle punch and popped it up with a Stampin dimensional. 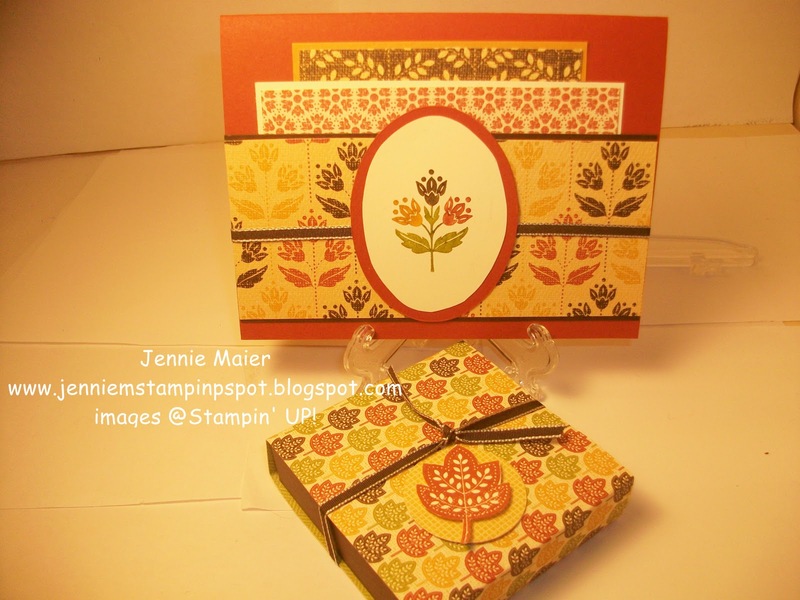 This stationary gift set is a present I made for my aunt. The top picture shows the outside of the portfolio and the bottom pic is of the note cards and envelopes on the inside. This is super easy to make. Just take an 8 1/2 by 11 piece of card stock and score and fold in half at 5 1/2. Then score the other end at 2 inches, fold up and adhere the side flaps only with Sticky Strip. 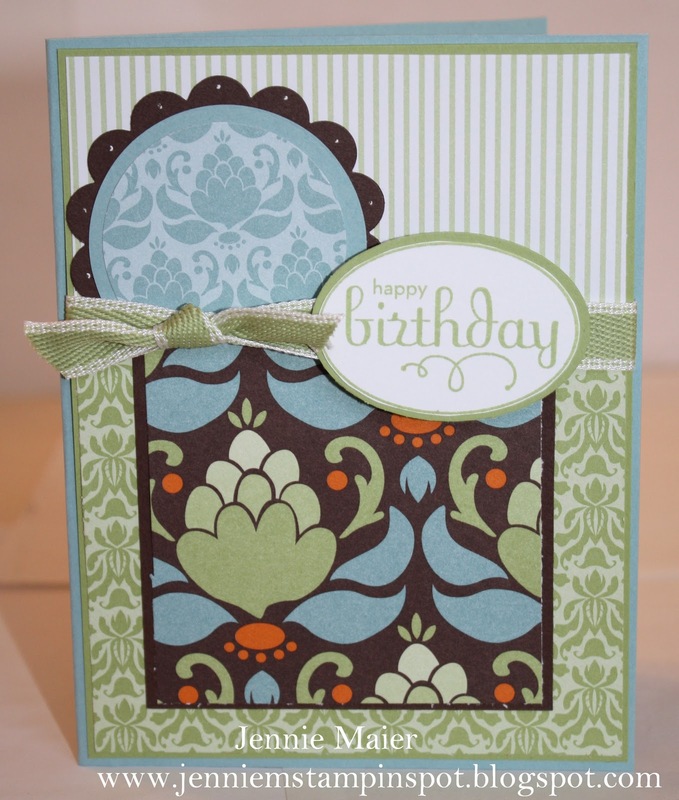 The note cards are just 8 1/2 by 11 pieces of card stock cut in 4 pieces of 4 1/4 by 5 1/2 inches. And the Very Vanilla was cut to 4 by 5 1/4 inches. I used two patterns from the Love Letter DSP on the front. 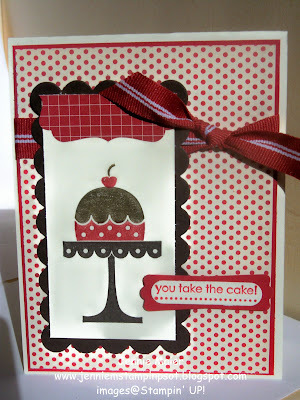 I stamped the images from Artistic Etchings on Very Vanilla with Riding Hood Red and Basic Black. 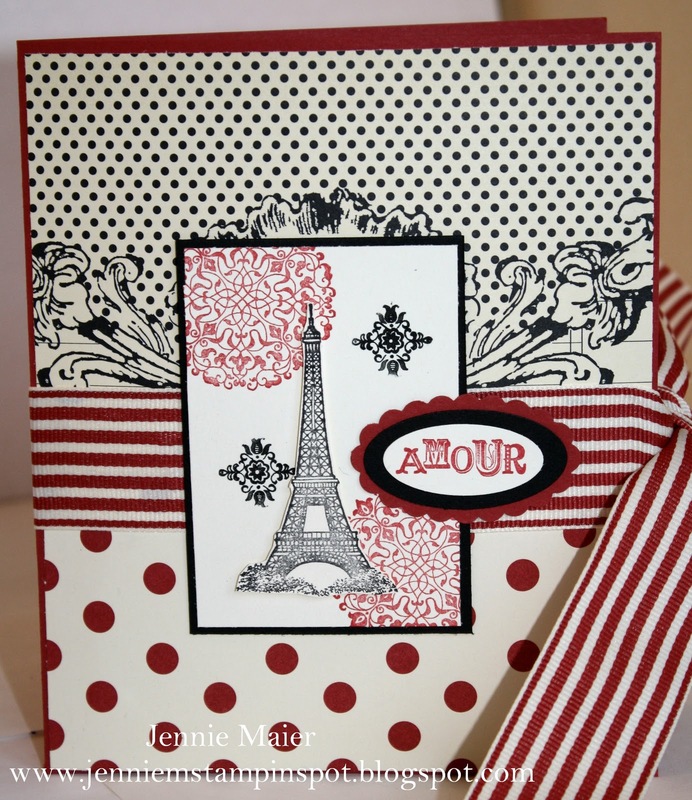 The Eiffel Tower was cut out and popped up with Stampin dimensionals. Amour was punched out with the 1 3/8 by 5/8 inch oval punch. That was layered onto a Basic Black piece punched with the 1 3/4 by 7/8 inch Oval punch and then onto a Riding Hood Red piece punched with the Scallop Oval punch. A piece of retired 1 1/4 inch Riding Hood Red Striped grosgrain ribbon, adhered with Sticky Strip ties nicely to close the folder. 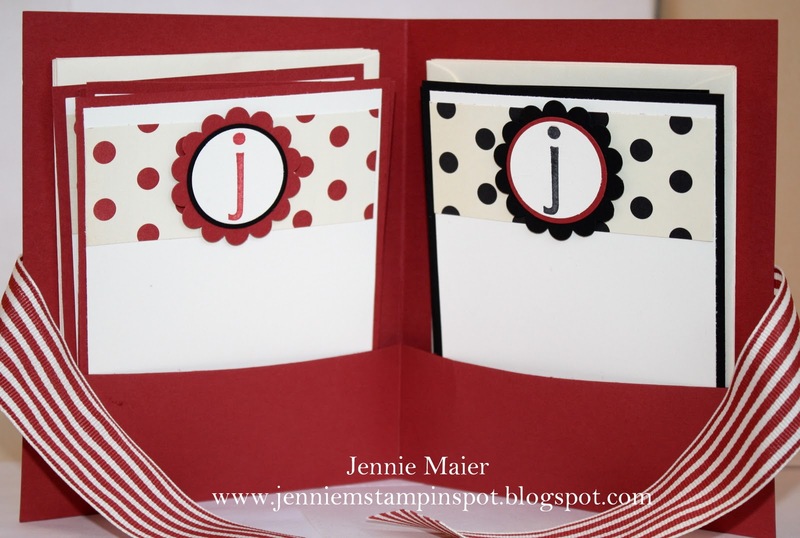 For the note cards I stamped the "j" from Contempo Alphabet in Basic Black and Riding Hood Red on Very Vanilla. and used the 1 1/4 inch Circle punch. That was layered onto a Riding Hood Red/Basic Black piece punched with the 1 3/8 inch Circle punch and then onto a Riding Hood Red/Basic Black piece punched with the 1 3/4 inch Scallop Circle punch and popped up with Stampin dimensionals. This is a sample I made with the stamp set and papers that are on sale in the Filled with Love promotion. This promo is good today thru January 24th. I also used the Splitcoast sketch#311 here. 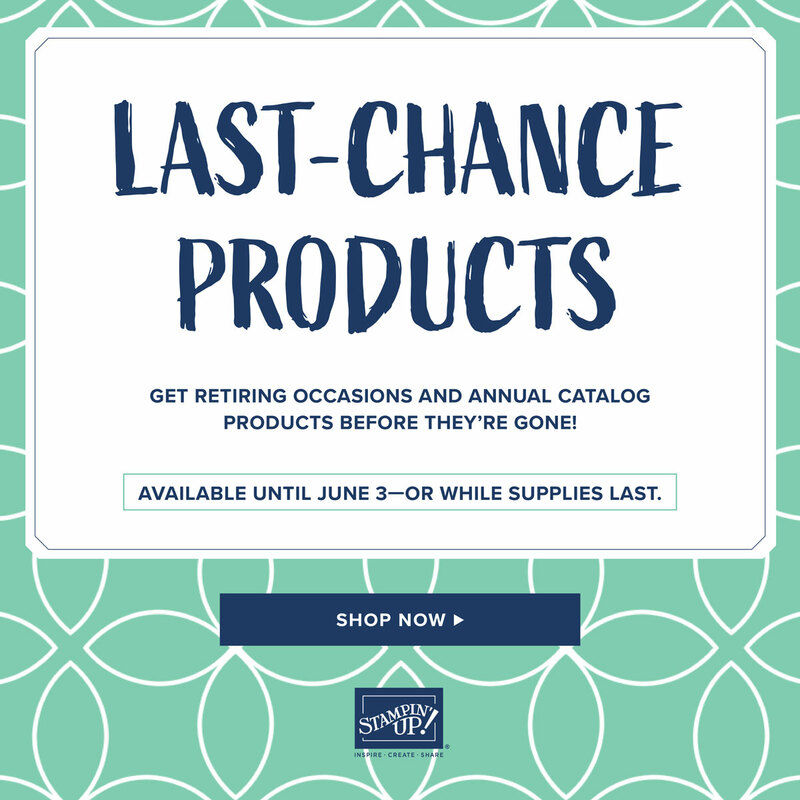 With this promo you can get the Filled With Love stamp set and Love Patterns DSP Pack and a set of FREE Bitty Buttons all for $32.90-Wood mounted or $26.90-Clear mounted. 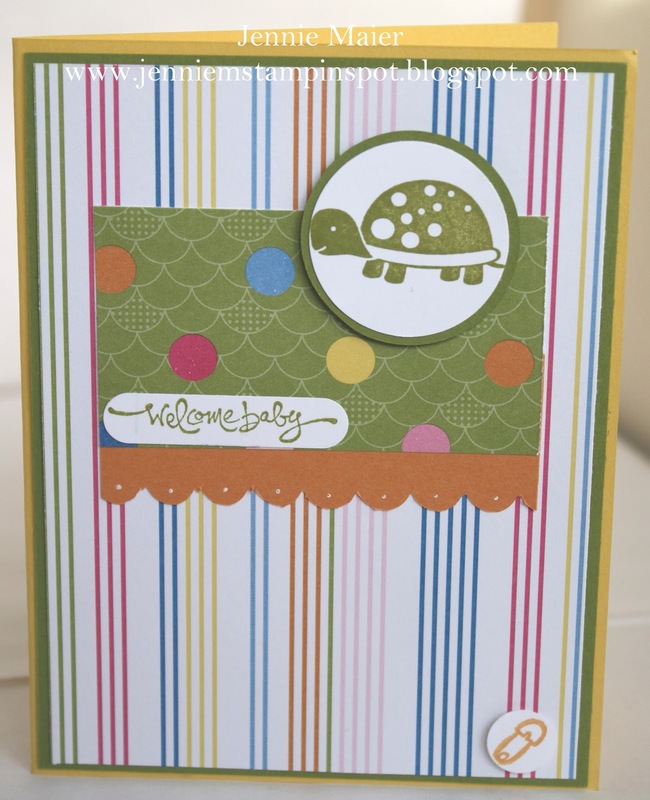 I started with a Real Red card stock base and ran that thru the Big Shot with the Perfect Polka-dot textured impressions embossing folder. I added some Pretty in Pink DSP from the Love Patterns DSP. 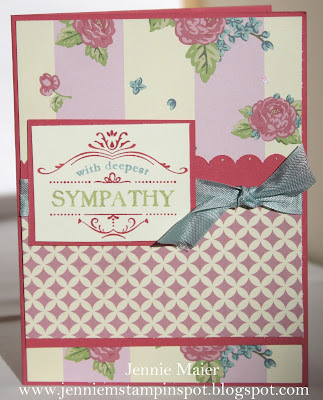 I stamped the little heart circle and the sentiment on Whisper White with Pretty in Pink. 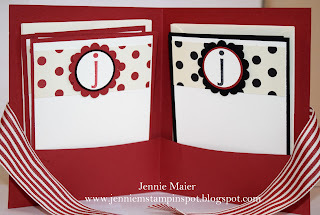 I stamped the large and small hearts in Real Red and punched out the large one with the XL Full Heart punch. 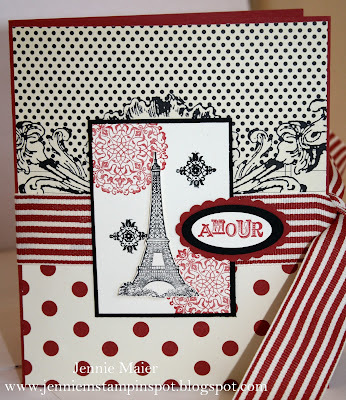 I layered that onto a Real Red piece punched with the XL Full Heart punch and popped it up with Stampin dimensionals. 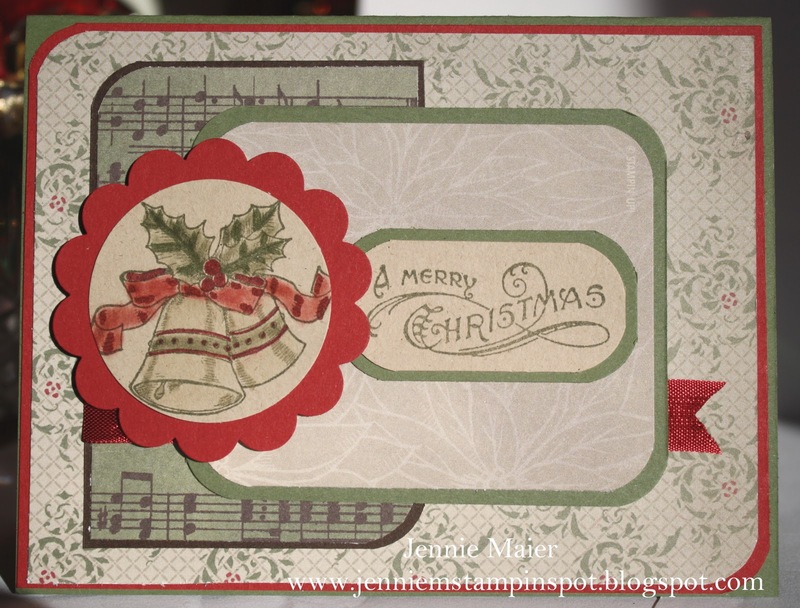 I had to take a break from Christmas cards to play with my Occasions Mini pre-order. 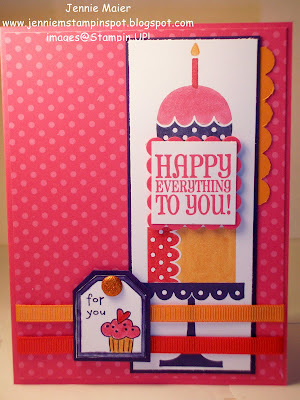 The stamp set I used is called Thanks for Caring and I paired that with some DSP from the Springtime Vintage DSP. I started with a Rose Red card stock base and added some Springtime Vintage DSP. I ran a strip of Rose Red thru the Scallop Edge border punch. 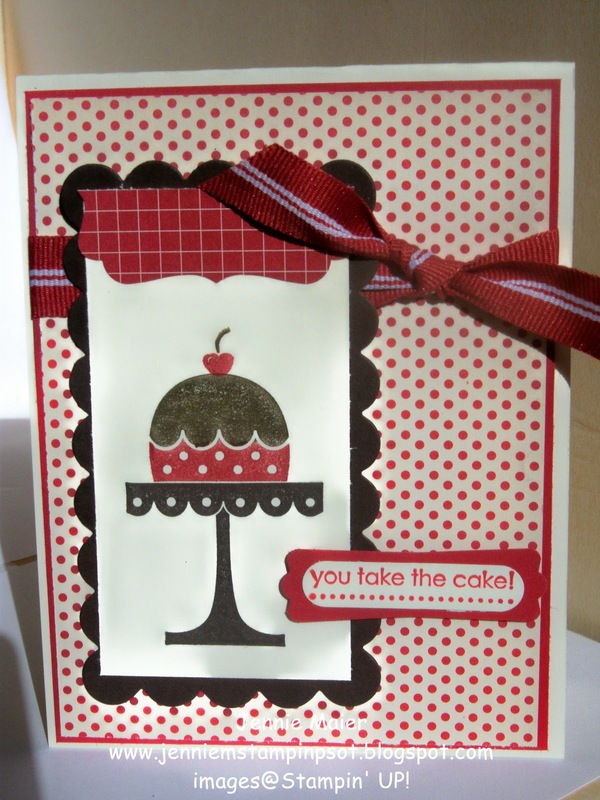 I used my Baha Breeze, Pear Pizzazz and Rose Red Stampin Write markers to color in the stamp, stamped that on Very Vanilla and matted it with some Rose Red. Finally, some new 1/2 inch Baha Breeze seam binding finishes it off. This card is for the MojoMonday sketch#169 here. It starts with an Always Artichoke base then some Cherry Cobbler and three different papers from the Deck the Halls DSP. Then I stamped the bells on Crumb Cake in Always Artichoke and colored it in with Always Artichoke, Crumb Cake and Cherry Cobbler Stampin Write markers and blender pens. I punched that out with the 1 3/4 inch XL Circle punch and layered it onto a Cherry Cobbler piece punched with the 2 3/8 inch XL Scallop circle punch. I stamped the sentiment in Always Artichoke on Crumb Cake and rounded some corners, matting it on Always Artichoke. Finally, some 1/2 inch Cherry Cobbler seam binding finishes it off. This card is for the Stamping 411 sketch#181 here. 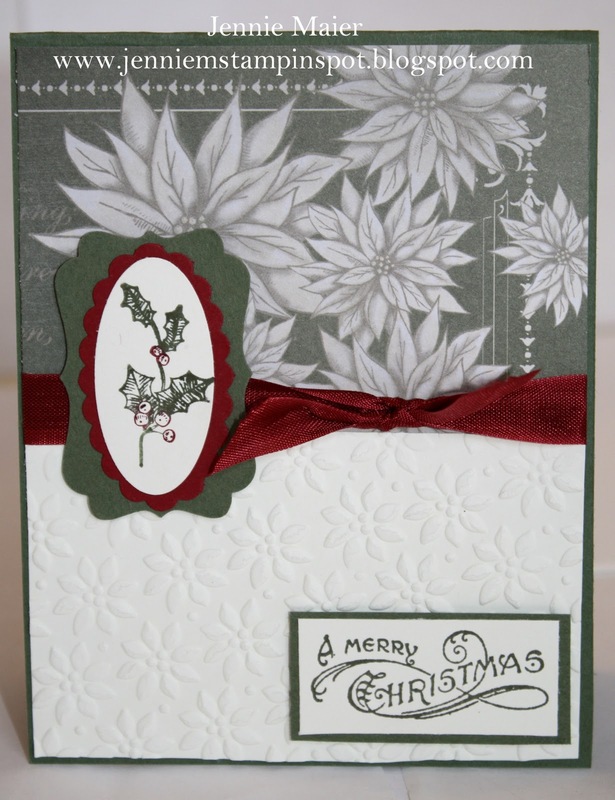 I started with Always Artichoke for the card stock base and added some DSP from Deck the Halls. 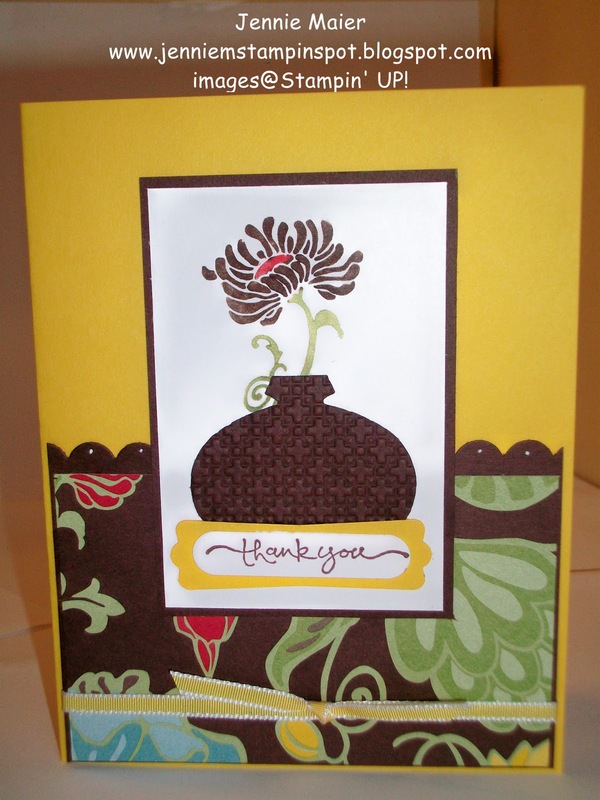 I ran a piece of Very Vanilla thru the Big Shot with the Petals-a-plenty textured impressions embossing folder. 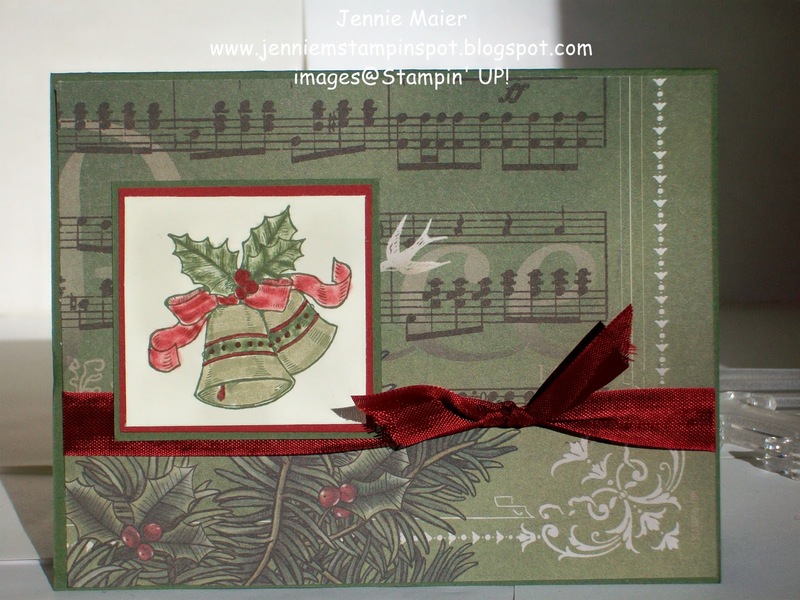 I colored in part of the holly stamp from Bells & Boughs with the Always Artichoke and Cherry Cobbler Stampin write markers. I punched that out with the 1 3/4 by 7/8 inch Large Oval punch. 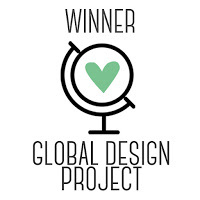 That was layered onto a Cherry Cobbler Scallop oval piece and an Always Artichoke Decorative Label piece, all popped up with Stampin dimensionals. 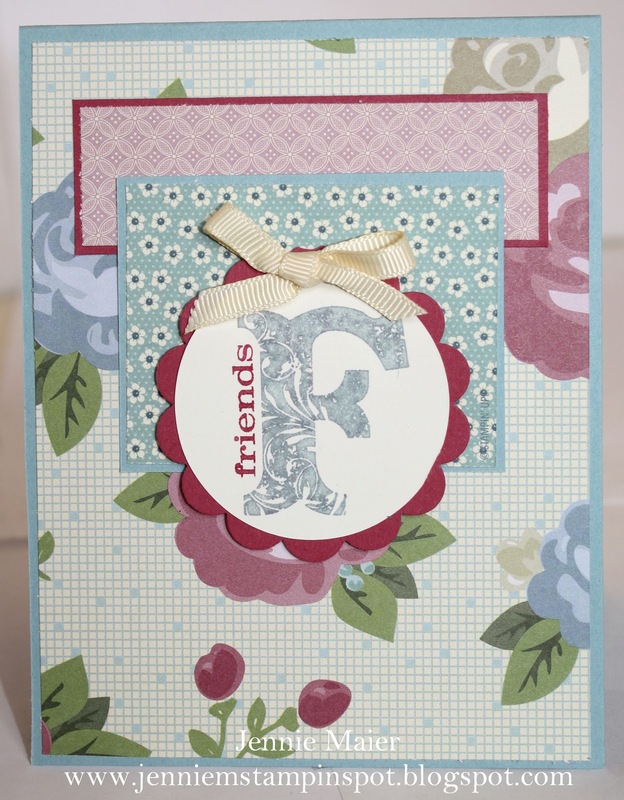 The greeting was stamped in Always Artichoke on Very Vanilla and matted with some Always Artichoke and popped up with Stampin dimensionals. Finally, some 1/2 inch Cherry Cobbler seam binding finishes it off. This is a quick one for the Clean & Simple FTL#120 here. It came together super quick! 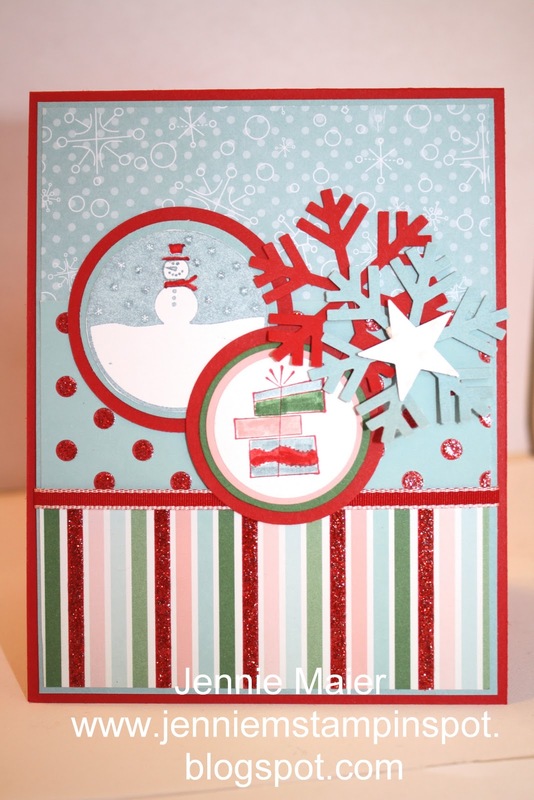 The base is Real Red card stock and I added papers from the Candy Cane Christmas Specialty DSP. 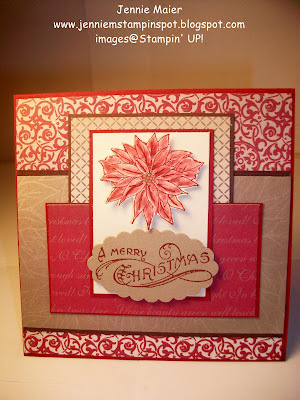 I stamped Merry Christmas from Season of Joy in Real Red on Whisper White and matted it with some Real Red. I used the XL Snowflake punch to punch out the Real Red snowflake and added a Circle Ice Rhinestone brad. Finally, some 1/2 inch Blushing Bride stitched-poly ribbon finishes it off. 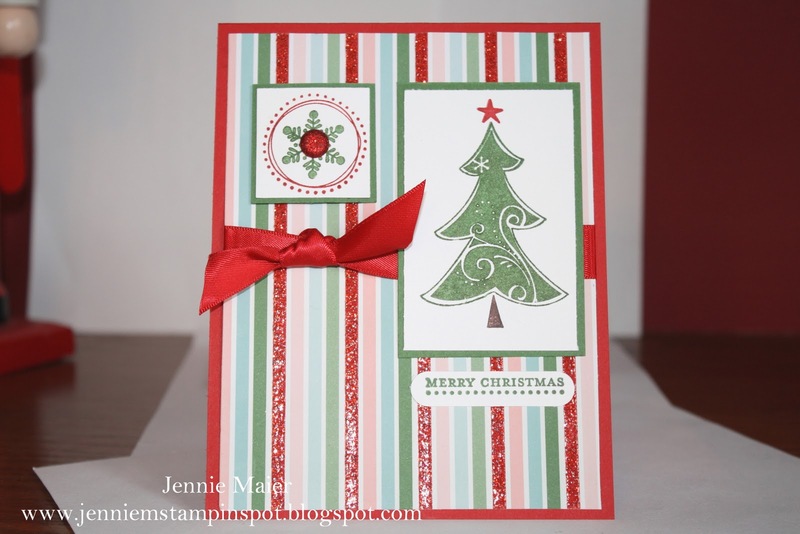 I made a few of these quick and cute Christmas cards. I started with Real Red card stock and ran it thru the Big Shot with the Petals-a-Plenty textured impressions embossing folder. 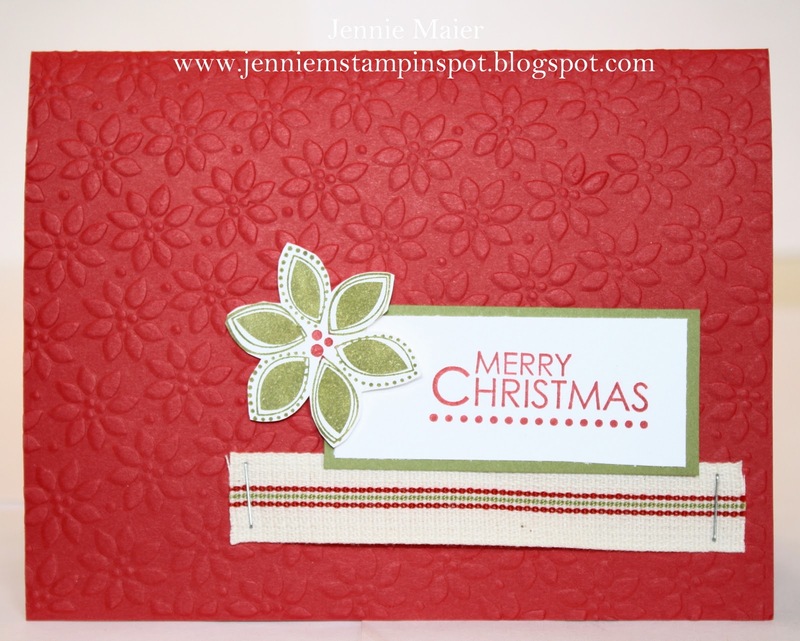 Then I colored the poinsettia from Season of Joy with my Old Olive and Real Red Stampin write markers, stamped it on Whisper White, cut it out and popped it up with Stampin dimensionals. Then I stamped Merry Christmas in Real Red on Whisper White and layered it onto some Old Olive. Finally, I stapled on a bit of retired ribbon. 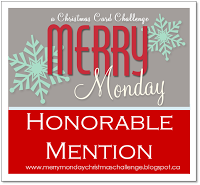 This sparkly card was made for the PPA#72 challenge here. I used some Brushed Gold card stock for the base and ran that thru the Big Shot with the Northern Flurry textured impressions embossing folder. I cut out two Top Notes with some Basic Gray and Very Vanilla card stock. I stamped the snowflakes from Snow Swirled with Versamark on the Very Vanilla. 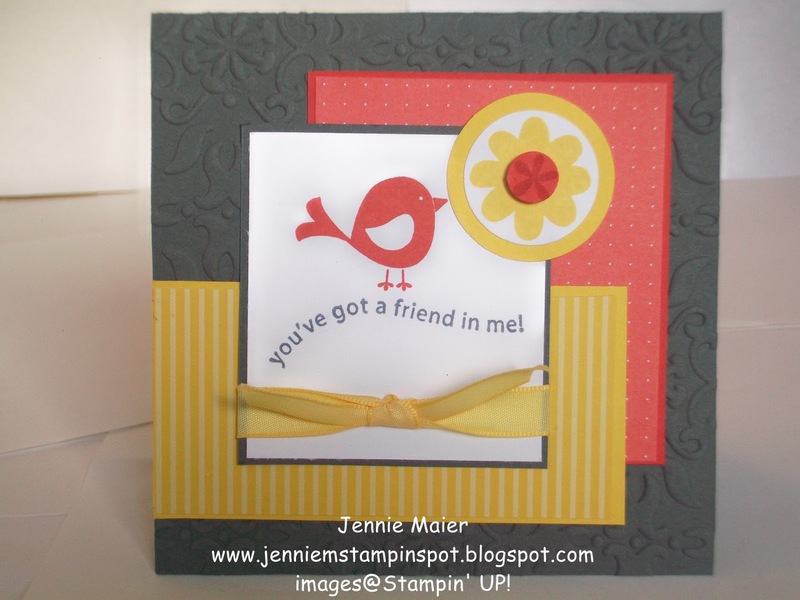 I then embossed them with Gold and Silver Stampin Emboss Powder. 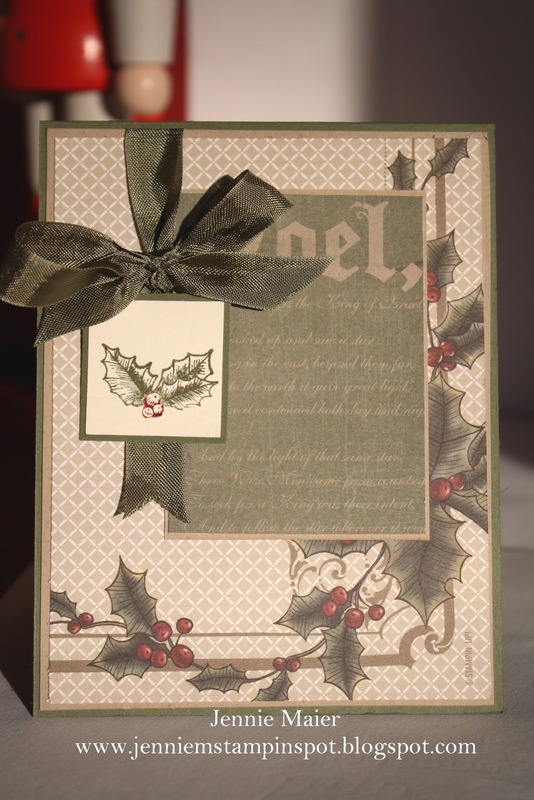 I also inked up the Season Greetings with Versamark and embossed that with the Gold powder. 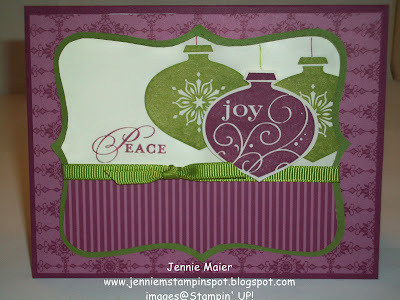 Then I punched that out with the Scallop Oval punch and layered it onto a piece of Basic Gray punched with the 2 by 1 3/8 inch Oval punch and popped it up with Stampin dimensionals. Finally, a piece of 3/8 inch Very Vanilla taffeta finishes it off. Another Christmas card for the Splitcoast Sketch#310 here. The base is Crumb Cake and then I added 2 different papers from Deck the Halls DSP. I colored the tree from Snow Swirled with my Always Artichoke and Cherry Cobbler Stampin write markers and stamped that on Very Vanilla. I stamped the snowflake in Cherry Cobbler, cut it down and added it to the top of the tree. I stamped that snowflake again in Always Artichoke and Cherry Cobbler and punched them out with the 3/4 inch Circle punch. That was layered onto Always Artichoke and Cherry Cobbler punched with the 1 inch Circle punch and popped up with Stampin dimensionals. Finally, a piece of 1/2 inch Cherry Cobbler seam binding finishes it off. 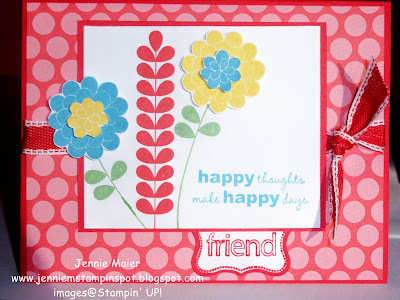 Over at Splitcoast Stampers it's the Color Challenge#300 and you get to choose which color combos you want to do. 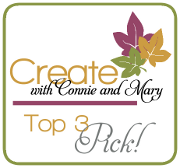 So I choose CC233-Real Red, Chocolate Chip and Kraft or Crumb Cake. 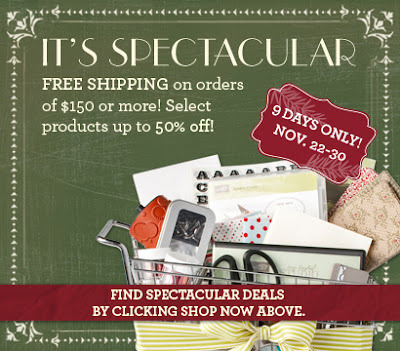 I still need Christmas cards! 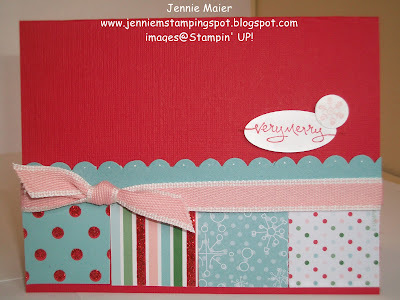 I started with running the Real Red card stock thru the Big Shot with my Northern Flurry textured impressions embossing folder. 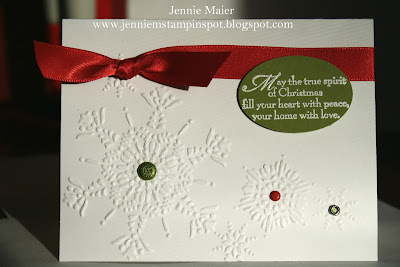 I added some dots to the centers of the smaller snowflakes with my White gel pen. 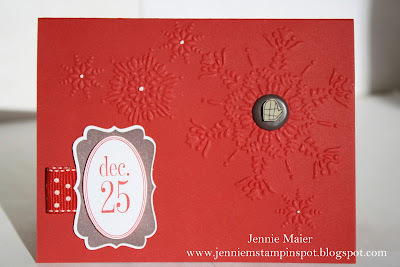 I stamped the Dec 25 tag from Tags til Christmas in Chocolate Chip and punched it out with the Decorative Label punch. I stamped it again in Real Red, cut out the oval and popped it up with Stampin dimensionals. I added a scrap of the 3/4 in Real Red polka-dot ribbon which is retired. I added a 5/8 inch Chocolate Chip Jumbo brad. And onto the brad I added a little mitten from A Cute Christmas that was stamped in Chocolate Chip on Crumb Cake. 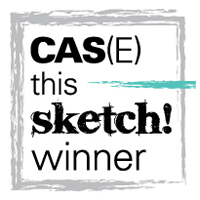 This is my card for the MojoMonday sketch#168 here. 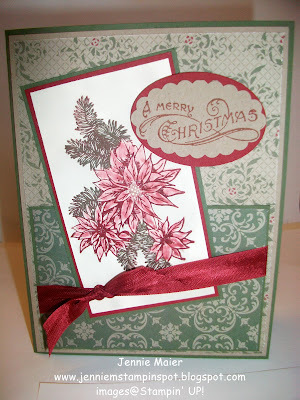 I started with Always Artichoke card stock for the base, added some Crumb Cake and then DSP from the Deck the Halls DSP. I added some more Deck the Halls DSP for the large rectangle. I colored in part of the bells stamp from Bells & Boughs with the Always Artichoke and Cherry Cobbler Stampin write markers and stamped that on some Very Vanilla. That was punched out with the 1 1/4 inch Square punch and layered on to an Artichoke piece punched with the 1 3/8 inch Square punch. I popped those squares up with Stampin dimensionals. Finally, some 1/2 inch Always Artichoke seam binding finishes it off. 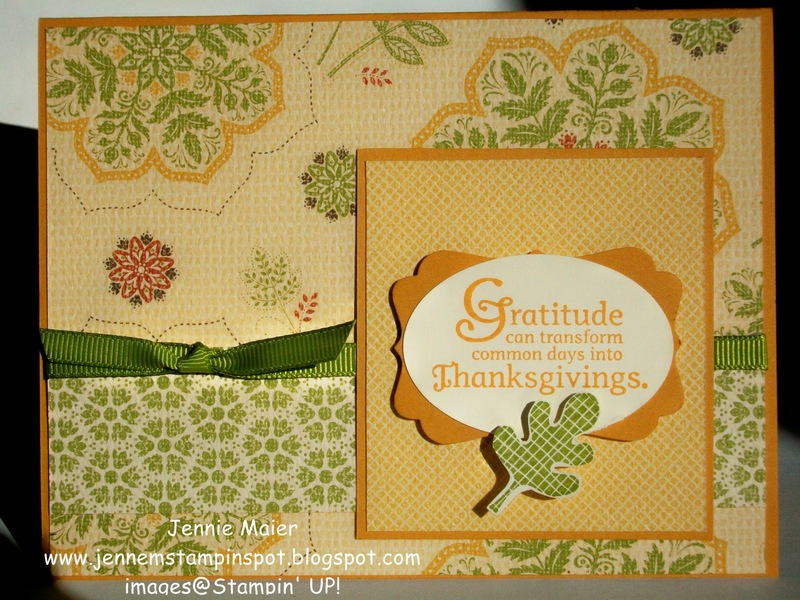 I made this card for the Stamping 411 Sketch#180 here. 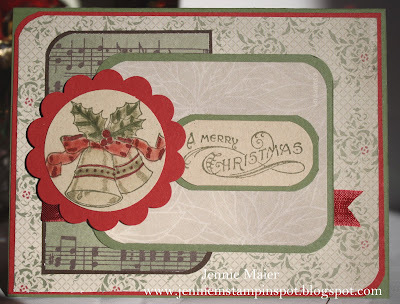 I gotta finish up making all my Christmas cards, so until my Occasions Mini pre-order arrives, it's all Christmas! 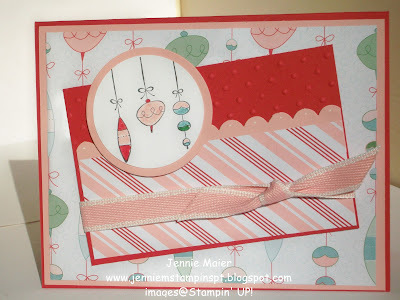 I started with a Real Red card stock base and added the adorable striped paper from the Candy Cane Christmas Specialty DSP. 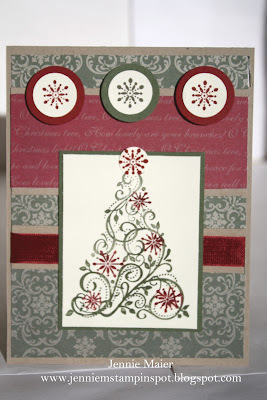 I colored the tree and snowflake stamps from Season of Joy with my Chocolate Chip(tree only), Garden Green and Real Red Stampin write markers and stamped them on Whisper White. I punched the snowflake piece out with the 1 1/4 inch Square punch and matted that with a Garden Green piece punched with the 1 3/8 inch Square punch. I added a Real Red Glimmer brad to the center of the snowflake. Merry Christmas from Teeny Tiny Wishes was stamped in Garden Green and punched out with the Word Window punch. Finally, some 5/8 inch Real Red Satin ribbon finishes it off. I made this Thinking of You card for the Clean and Simple FTL#119 here. I used my color coach for the color combo-Early Espresso, Marina Mist and Wild Wasabi. 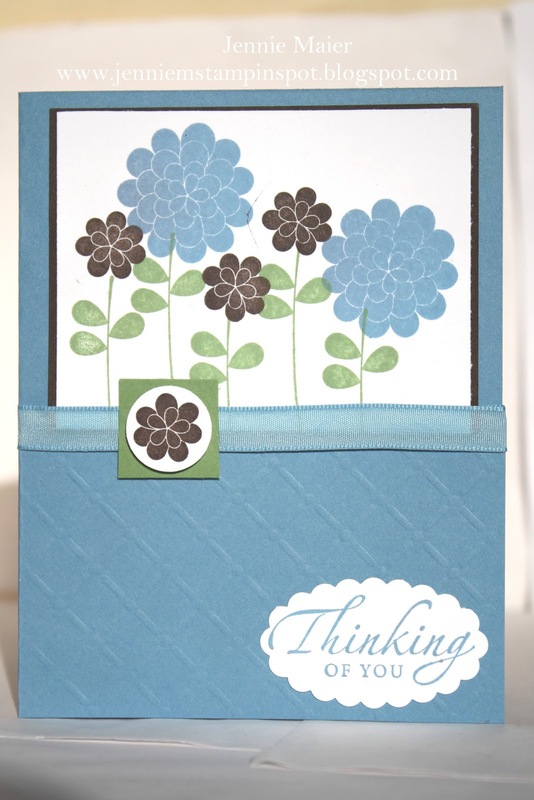 The base is Marina Mist card stock. I ran a piece of that thru the Big Shot with the Perfect Details Texturz Plates and adhered it to the bottom of the card. I used my Stamp-a-ma-jig to stamp the stem and flowers from Apple Blossoms on Whisper White in Wild Wasabi, Marina Mist and Early Espresso. I stamped the small flower in Early Espresso and punched it out with the 1 inch Circle punch, popped it up with a Stampin dimensional and added a Wild Wasabi square. Thinking of You from Sincere Salutations was stamped in Marina Mist and punched out with the Scallop Oval punch. Finally, a piece of 3/8 inch Marina Mist taffeta ribbon finishes it off. 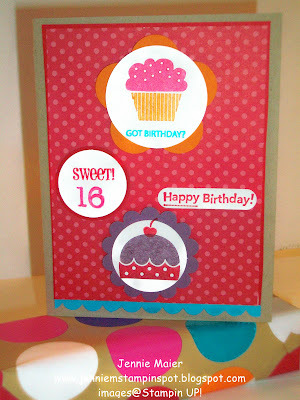 This is a birthday card for the PPA#71 Color Challenge here. The colors are Early Espresso, Pear Pizzazz and Regal Rose. 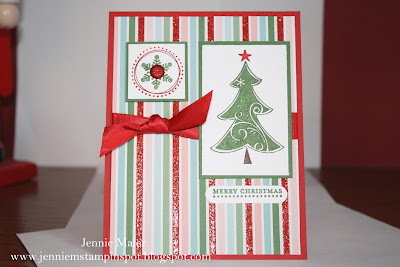 Early Espresso is the card stock base and I added some DSP from Deck the Halls. The other DSP in Pear Pizzazz is from the DSP Pack In-Color and the Regal Rose DSP is from the Patterns DSP Brights Stack. I colored the images from Birthday Bakery with my Early Espresso Stampin write marker and stamped them on Whisper White, punching them out with the 1 inch Circle punch. They were then layered onto an Early Espresso piece punched with the 1 1/4 inch Circle punch and popped up with Stampin dimensionals. 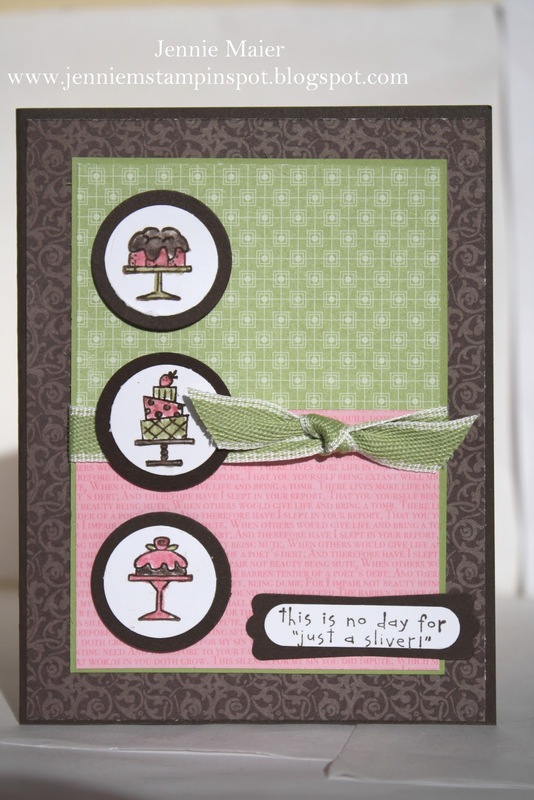 All of the images were colored with the Early Espresso, Pear Pizzazz and Regal Rose Stampin Write markers. I stamped the sentiment in Early Espresso on Whisper White, punched it out with the Word Window punch and layered it onto an Early Espresso piece punched with the Modern Label punch. A piece of 1/2 inch stitched-poly Pear Pizzazz ribbon finishes it off. 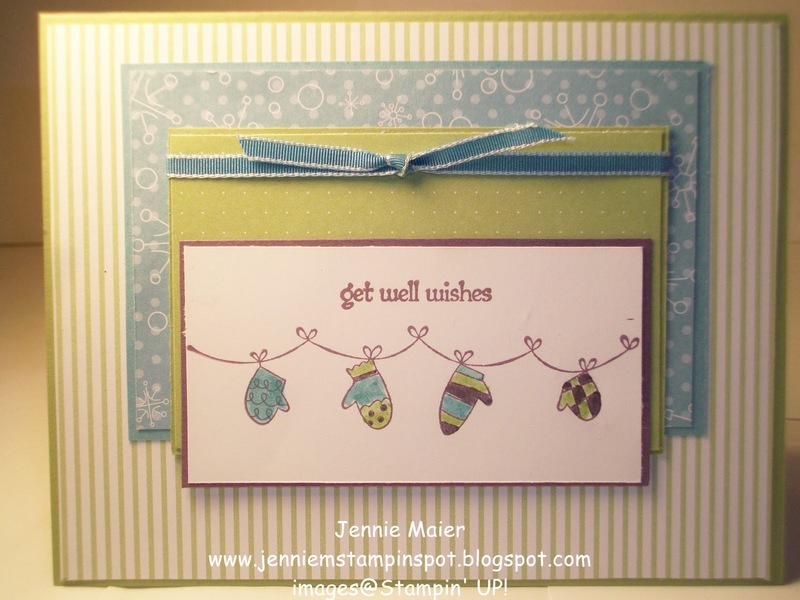 I made this quick card for the SUO Challenge #7 here. 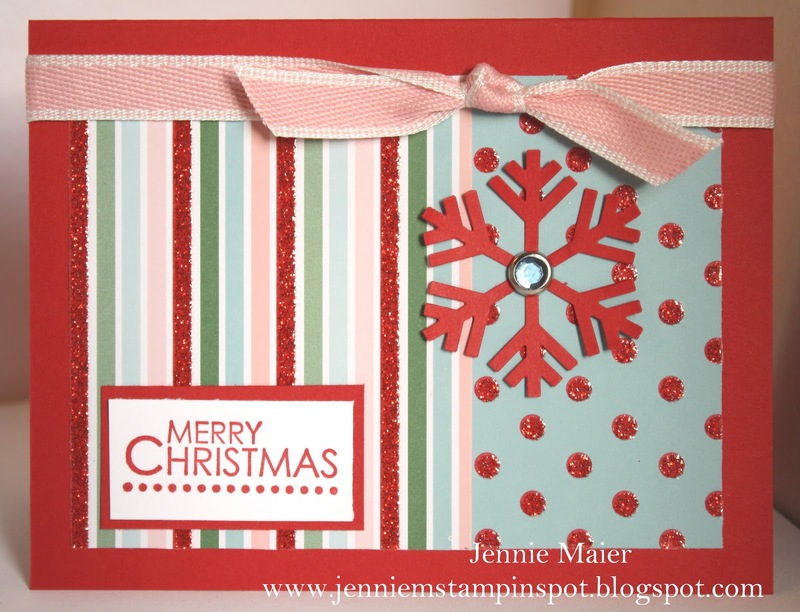 The challenge is to make a clean and simple Christmas card and this one is pretty clean and simple. 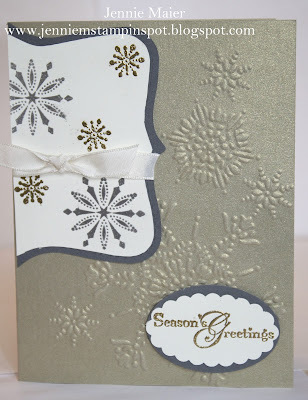 I started with a base of Whisper White card stock and ran it thru the Big Shot with the Northern Flurry textured impressions embossing folder. I added three brads to the center of the snowflakes: an Old Olive Glimmer brad, a Real Red Brights brad and a Green Circle Ice Rhinestone brad. I stamped the sentiment from Snow Swirled in Whisper White Craft ink on Old Olive. 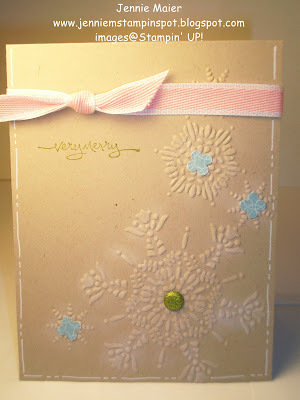 I embossed that with White Stampin' Emboss powder. Then I punched it out with the 2 by 1 3/8 inch XL Oval punch and popped it up with Stampin' dimensionals. Finally, a piece of 5/8 inch Real Red Satin ribbon finishes it off. I combined two Splitcoast Challenges for this bright Christmas card. First, CC299 here and second, SC309 here. The color combo is Real Red, River Rock and Old Olive. So I started with a card stock base of River Rock and added some Real Red and Old Olive DSP from the Patterns DSP Brights Stack. I colored the stamp from Season of Joy with my Real Red, River Rock and Old Olive Stampin write markers and matted that on a piece of River Rock. I stamped Merry Christmas in Real Red onto some Whisper White and punched that out with the 1 3/4 in by 7/8 inch Large Oval punch. Then that was layered onto a Real Red piece punched with the XL Scallop Oval punch and popped up with Stampin dimensionals.Finally, a piece of 1/4 inch Old Olive grosgrain finishes it off. This is my take on the MOJO#167 sketch here. It starts with a Real Red card stock base and I added different patterns from the Candy Cane Christmas Specialty DSP. 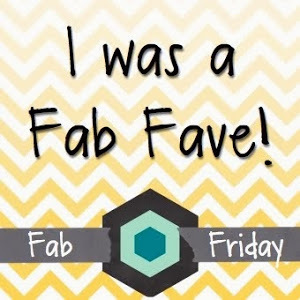 I used the Circles#2 Big Shot die and the following circle punches for all the circles: 1 1/4 inch and 1 3/8 inch Large circle punches and the 1 3/4 inch XL large circle punch. 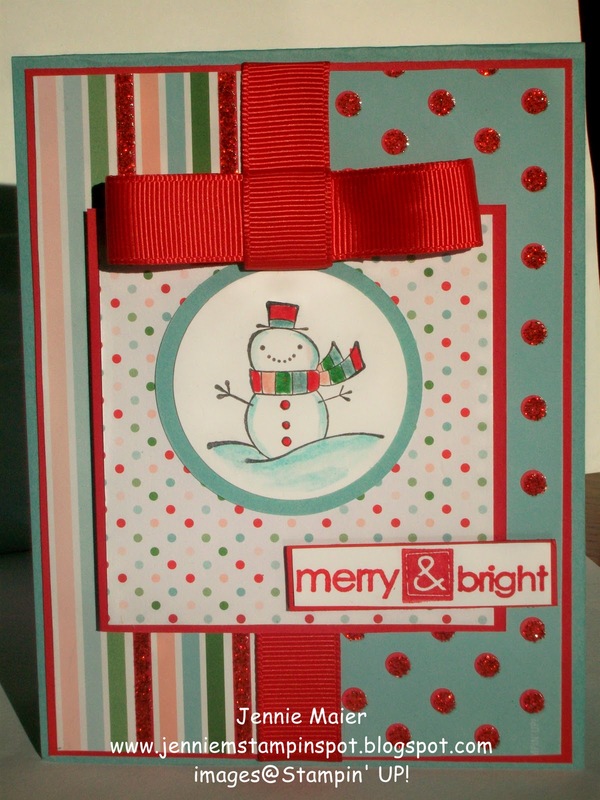 The snowman stamp from Tags til Christmas was colored with Baha Breeze and Real Red Stampin write markers and punched out with the XL 1 3/4 in circle punch. 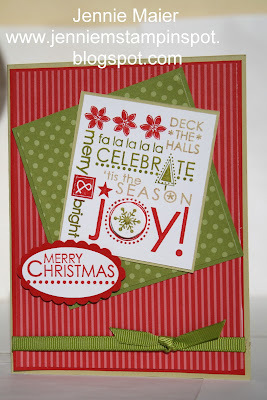 The presents from A Cute Christmas were stamped in Real Red and colored with Baha Breeze, Blushing Bride, Garden Green and Real Red Stampin write markers. I punched a Baha Breeze and Real Red snowflake with the XL Snowflake punch and used the retired Small Star punch for a Whisper White star. Finally, a little piece of 1/8 inch Real Red taffeta finishes it off. This sure was a Clean & Simple and fast card! I made it for the FTL#114 here. 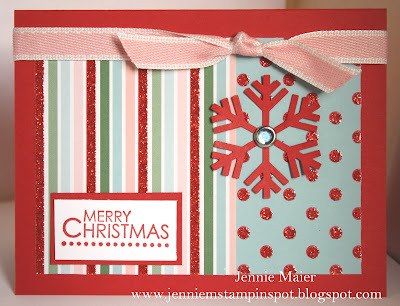 The base is So Saffron card stock and then I stamped on Whisper White, punching the corners with the Ticket Corner punch. 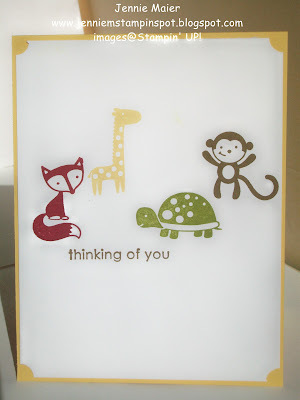 I used the Fox and Friend set and Trendy Trees for the sentiment. My Color Coach gave me the color combo of Soft Suede, So Saffron and Cherry Cobbler and I added Old Olive myself. It's that simple and that fast!